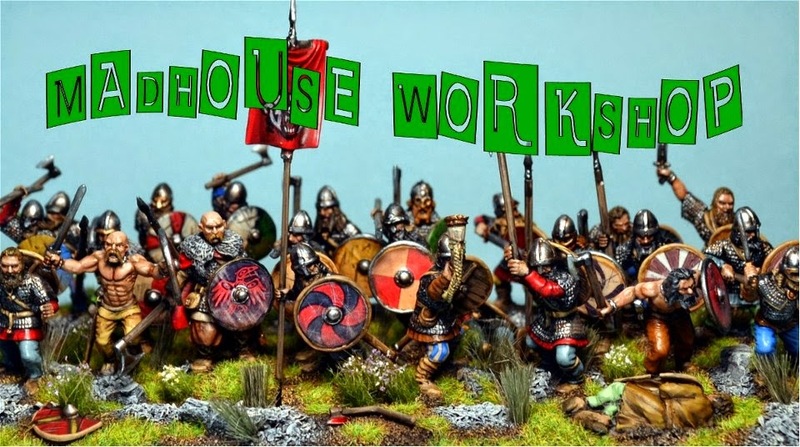 Well more like a just an assembly of a lot of my painted Foundry Vikings. They are fun models. I do have to say I really enjoyed the beards on these guys, I've always struggled sculpting beards on my guys and they definitely gave me ideas on what I was doing wrong in my attempts. I decided to give them pretty much all plastic shields from left over Gripping Beast models. I just think the plastic shields are much nicer. I did see that Victrix is getting ready to release their kit with some even larger plastic shields and I'm going to assume that their scale may be slightly larger than the GB Plastics. They are old sculpts, but I think they do stand the test of time. I really like the guy with the white raven shield second from the corner. They you are, more to follow. thanks Michal. Yea these guys were fun. They look fierce and splendid, great painting and basing! Thank you Phil. I definitely had a lot of fun with them. I kept the basing the same as my other Vikings and Saxons as they'll likely see action with them on the same table. Great unit of Vikings!The plastic shields look right with these figures, more so than the metal ones supplied. Thanks Ross. Yea I think the shields really show their age on these sculpts. The sculpts for the most part still hold up.